Assassin's Creed 3 is on the way and to let us know, Ubisoft has graced us with a game trailer. A new 18th century backdrop will house the largest project in Ubisoft's history, touting a slew of changes and finer attention to details than ever before. Assassin's Creed 3 is currently expected to ship October 30 of this year. Also just recently, a vast quantity of details about the upcoming title were leaked to Game Informer and over a dozen screenshots have been revealed at All Games Beta. This time, the story will center around a half English, half Native American Assassin named Ratohnhake (pronounced Ra-doon-ha-gay-doo). If you have trouble remembering that one, you may be relieved to know he also goes by Connor. 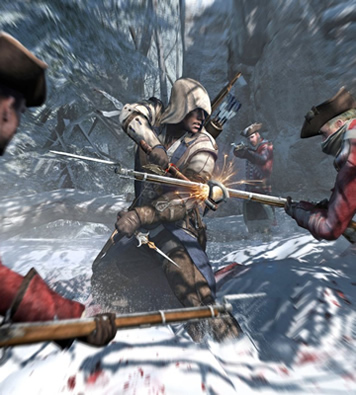 We now know that Assassin's Creed 3 takes place in American revolutionary war times. The "frontier" serves as the story's backdrop. Players will also get the chance to work with George Washington, Benjamin Franklin and General Charles Lee as the story unfolds. The world itself is said to be 50% larger than the one Assassin's Creed 2 took place in, featuring snowy winters, majestic mountain cliffs and beautiful woodlands. In addition to a radically new setting, the new Anvil game engine promises technical superiority over previous iterations of the game. Anvil boasts "thousand man battles", highly detailed facial expressions and a completely redesigned animation system with no animations carried over from previous games. The engine will also provide greater realism -- soldiers will move more slowly in the fridgid cold while thick snow cover will cause them to move about more clumsily, for example. Here is but a small sampling of what to expect. Follow the link below for an exhaustive list. The Frontier is not empty like in Assassin's Creed 1, but features a third of the game's missions and gameplay content. They're not unveiling anything about the multiplayer yet. There's no more target locking, it just automatically detects your target. Counter/defense are the same button to prevent turtling.